Furriers saw themselves as distinct from other branches of the clothing trade. Fur was expensive and only the very wealthy could afford to buy fur garments for everyday wear. At the beginning of the 19th century, fur was used for lining coats and cloaks and was worn more often by men than women. In the middle of the century, fitted sealskin jackets became very fashionable. They were the first fur garments designed for daily wear rather than as a warm garment for travelling. 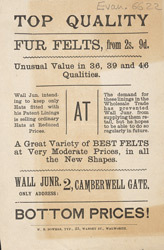 By the end of century, stores such as this one were selling cheap, good-quality imitation fur.